Have you ever wondered what all those checkboxes mean in the Advanced Search screen? Or how to interpret your InMail Feedback Score? Or even how you should best craft an InMail message or a job posting? Good news - we have answers for you when you need them. 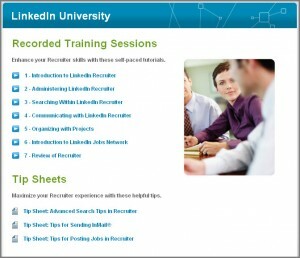 LinkedIn offers many training options for LinkedIn Recruiter users. LinkedIn Client Services maintains an online searchable knowledge based within the Service Center where you can review answers to hundreds of questions about LinkedIn Recruiter. You can access this resource by clicking "Support" in the right side of the header of the Recruiter interface (as seen above). Here you'll find answers to everything from how to change your password to how to create a Project to how to send InMail to more than one person at a time. The videos and tip sheet found here can help get you started or help refresh your memory. You can also get insight into other customer's success and read educational blog entries. If you're more of a visual learner, we have a library of videos to help. The Training team at LinkedIn has created LinkedIn University for you. You can access this resource by clicking the "Training" link in the right side of the header in Recruiter (as seen above). If you really want someone to tell you what to do or if you have specific questions you want to ask a trainer, sign up for one of our instructor- led courses. We offer classes on different topics related to LinkedIn Recruiter on an almost daily basis and across all time zones. Register here for the course that suits you. Note: times on the schedule are Pacific. In summary: whether you learn best by seeing, listening or doing, we've got a resource for you.